It’s a new week and a new beautiful month, who can hardly believe December is already here? I enjoyed a weekend of shopping, time with friends and teaching a decadent pinup workshop. For this week’s Monday Morning Glamour inspiration I have for you the beautiful Dorothy Dandridge, an actress, singer and dancer who starred in such films as Carmen Jones, and Bright Road. Make this the week you dream big and make it happen! More vintage fun coming soon! 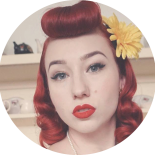 This entry was posted on December 3, 2018 by Miss Lady Lace in Monday Morning Glamour and tagged 1940's, 1950's, blogger, glamour, miss lady lace, miss lady laces pinup blog, perth, perth pinup, perth pinup blog, perth pinup community, pin up, pinup, pinup blog, pinup blogger, pinup fashion, pinup girl, pinup life, pinup lifestyle, pinup perth, red lips, retro blog, retro girl, retro glamour, the perth pinup community, victory rolls, vintage, vintage blog, vintage blogger, vintage fashion, vintage girl, vintage glamour, vintage perth, vintage pinup blog.